A primary theme of this blog is to explore the different processes that affect the existence and evolution of planets that could harbor life. Today’s question: Are binary stars good or bad? Tatooine seemed relatively habitable and had great sunsets. A binary star system is just two stars that orbit each other. In Astronomy 101, you often hear the phrase “3 out of every 2 stars are in binaries”. The stars in the night sky hide their numbers because many that we see as single are actually two stars that our eyes cannot separate. Between about one third and one half of all stellar systems are binaries, depending on the type of star. The orbits of binary stars come in all shapes and sizes. Some binary stars are so close that they orbit each other every few hours. Others are so distant that they take a million years to complete an orbit. Planets in binary star systems come in two families of orbits (see image below). Consider two stars A and B. A planet P can remain outside the orbit of the two stars in a “P-type” orbit. Or planet P could be in orbit around star A, while star B’s orbit remains outside the planet’s. This is an “S-type” orbit. More than 50 planets have been discovered on S-type orbits around other stars, with binary stars separated by up to thousands of AU (1 AU is the Earth-Sun distance). Recently, planets have also been discovered on P type orbits around close binary stars. Compared with single stars like the Sun, is it good or bad to have a binary star? The answer is: bad. Binary stars perturb the planets via their luminosity (their light) and their gravity. Planets in binary systems have more challenges to overcome than planets around single stars. But some binary stars are basically neutral whereas others can be destructive. Let’s break it down by the orbital distance between the two stars. We’ll start with very close binary orbits and move farther away. For simplicity, once we enter the S-type regime we’ll assume that the planet-hosting star is Sun-like. And the planets we are most concerned with are those on the right orbits for life, within the so-called “habitable zone“, where liquid water can exist on a planet’s surface. For binary stars on very close orbits, there does not appear to be a big problem forming or retaining planets in the habitable zone. We know of 5 systems that have planets on P-type (Tatooine-like) orbits, including a 2-planet system with a Neptune-sized planet in the habitable zone. In systems with wider binary orbits the gravitational effects of the two stars can make it difficult to form planets in the habitable zone. The exact location of the habitable zone is affected by the presence of two central stars, but there are no show stoppers. 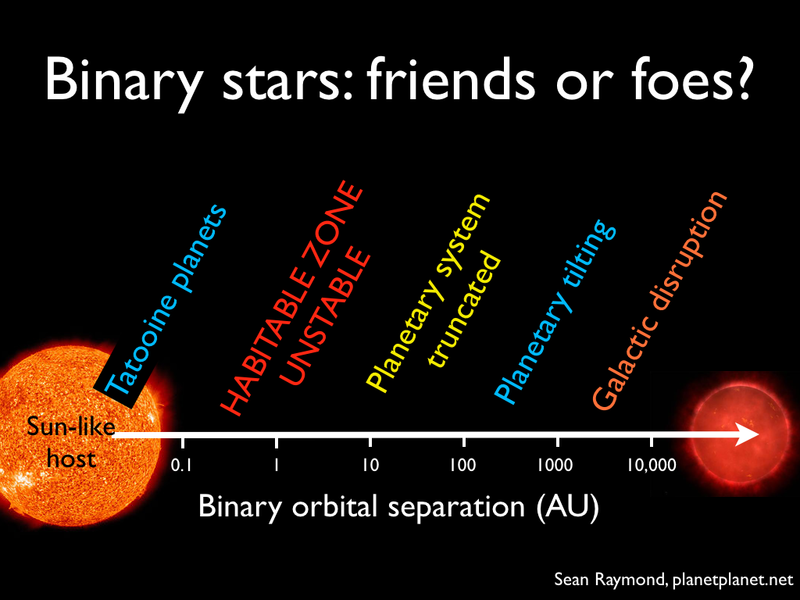 Stars with binaries separated by about 0.1-10 AU are not good places for life. The gravity of the binary wipes out any possibility of planets existing in the habitable zone at 1 AU. For binaries separated by more than 10 AU things get more interesting. In this regime the binary star’s gravity has a key influence. When the binary star’s wide orbit is in the same plane as the planets, planetary orbits larger than about one third of the binary’s orbit are not stable. That is, if the binary star B’s orbit around star A is 30 AU wide, then no planet can orbit star A farther than about 10 AU. Applying this simple rule of thumb, if the Solar System had a binary star, the planets’ orbits should be stable as long as that star was separated by at least 90 AU (since Neptune’s orbital distance is about 30 AU). But computer simulations of the evolution of the planets’ orbits show that the Solar System would actually be unstable with a binary even several hundred AU away. The reason has to do with the actual orbit of the binary star. Binaries that are very close to each other probably formed from a common parcel of gas, and so the orbits of the two stars were lined up with their planet-forming disk. However, more distant binaries did not form in the same gaseous cocoon. 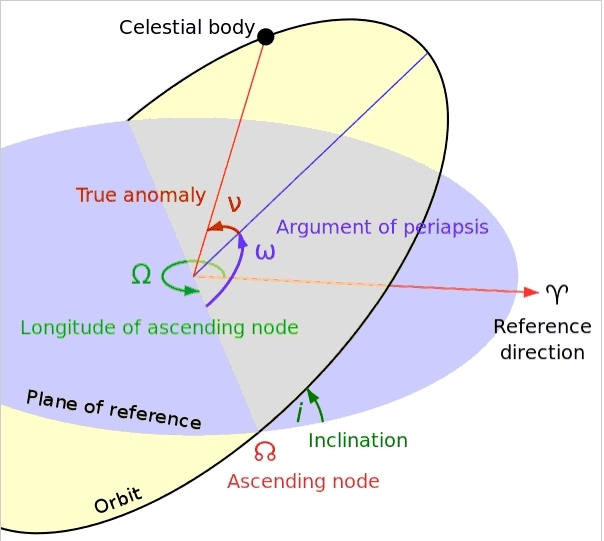 So their orbits are not connected with the orbits of the planets. This means that the orbits of distant binary stars are, for the most part, inclined with respect to the orbits of the planets. That is, if the planets orbit star A within a given plane, say on a desktop, star B’s orbit is at an angle to that plane. Star B’s orbit is also likely not to be circular but rather be stretched out or “eccentric”. Eccentric and inclined binary stars impart much stronger gravitational kicks than binary stars on circular orbits that are aligned with the planets’ orbits. The inclination is the angle between the yellow and blue planes, representing the orbits of two bodies (in our case, a binary star and a planet). From http://en.wikipedia.org/wiki/Orbital_elements. When the orbits of the Solar System’s planets are simulated in the presence of a binary separated by 100 AU, the system becomes unstable within a few million years. The shapes of the outer planets’ orbits are stretched out until two planets’ orbits cross. When two planets end up close to the same place at the same time, they gravitationally scatter and their resulting orbits are even more eccentric. This spreads the instability to the whole system. The outcome of the instability is typically the ejection of one or more planets into interstellar space, or collisions between the planets. The final system is more compact than the starting one, because the binary destabilizes the system from the outside in. While planetary systems like the Solar System would not survive with this type of binary star, more compact systems could survive because their orbits are better protected from the binary star’s gravitational bullying. The net effect of the binary is therefore to make the planetary system more compact by truncating its outer edges, that is, by removing any distant planets from the system. Binary stars on more distant but still on inclined orbits can tilt entire planetary systems. With its long orbital period, the gravitational kicks from a wide binary star can be absorbed by the system and the net effect is to cause the plane of the planets to wobble while the planets themselves maintain a common plane. Imagine a frisbee wobbling on a table: the planets’ orbits remain in the same plane while that plane wobbles. The extra-solar planetary system 55 Cancri contains 5 planets and a binary star separated by ~1000 AU. We think that 55 Cancri’s planets are on coplanar orbits but are tilted with respect to the equator of their host star (which should represent the planets’ starting plane). You can see a movie of how this works here. Binary stars on very wide orbits do not behave as expected. The gravity between two bodies — in this case the planets and the binary star — is weaker when the bodies are farther apart. So a binary star’s gravitational influence on a planetary system should be smaller the wider the binary star’s orbit, right? The widest binary stars — with separations of 1000 AU or more — are actually more destructive to planetary systems than binary stars with separations of less than 100 AU (but on P-type orbits). We know this is true from the sample of detected gas giant exoplanets. Specifically, the eccentricities of these planets are a measure of the dynamical history of those systems. Higher eccentricities imply more violent dynamical histories characterized by strong orbital instabilities. Giant planets orbiting stars with binaries within 1000 AU have the same statistical distribution of orbital eccentricities as giant planets orbiting single stars. But giant planets orbiting stars with very wide binaries have statistically higher eccentricities than giant planets orbiting single stars or orbiting stars with closer binaries. With their very long orbits, wide binary stars are sensitive to weak perturbations from outside their planetary systems! Wide binary orbits are slowly pushed and pulled by the Galaxy itself, and occasionally kicked by any stars that pass within a few light years. Unlike closer binaries, the orbits of wide binary stars change in time. Wide binary orbits are slowly stretched and pulled such that every billion years or more they enter a phase that is very eccentric. (In fact, they change in the same way Oort cloud comets do in the Solar System.) During this highly eccentric phase, they pose a big threat to planetary systems because they make much closer approaches to the planets. Since it takes billions of years for the Galaxy to modify their orbits, wide binary stars disrupt planetary systems long after they have formed, possibly after the emergence of life on some planets. Not good for life! You can see a movie of this process in action here (binary star’s orbit on the left, planets on the right). The following image puts the pieces together. Effect of a binary star on planets in the habitable zone orbiting a Sun-like host star for the full range of binary orbital separations. Blue outcomes are OK for life, whereas yellow, orange and red outcomes are progressively more destructive. There you have it: if you want to live on an Earth-like planet at 1 AU in a binary star system, your best bet is to either: a) live on a Tatooine-like world on a P-type orbit around two Suns, or b) have a distant binary companion star that probably makes your whole planetary system wobble and tilt. That is a neat idea, although it can only work for the right kind of binary stars. This effect applies to a fraction of what I called “Tatooine planets”. Some other Tatooine worlds should actually have the opposite problem: binary stars can also spin themselves up to become more active. So, basically, the “Tatooine planets” category can be split in two: the inner part is bad for life (stars spin up and become more active) and the outer part is good (stars spin down and become less active). Thank you for this informative look at Binary Star Systems. However I find it strange that little detail is given to the relative mass of the stars. In particular, and to create an example question, how does the author feel about habitable planets in Alpha Centauri. The A and B Stars have a distance of about 11 to 35 AU, so the planetary plane would be truncated. How would the smaller Proxima Centauri effect the system? Tatooine could very well be in an S-type system. The whiter, higher star in the picture could be the sun-like star which the planet orbits. The apparently lower, more orange star could be a red giant farther away. The apparent closeness of the two stars could simply be a periodic “alignment” that occurs when the planet is on the farther side of its sun from the companion star. The apparently similar size of the two stars would thus bely the fact that the orange star is actually larger, but farther away. This would imply that the companion star is more massive than the planet’s sun, so that it could quickly evolve through the main sequence and expand into a red giant. Before the companion expanded and brightened Tatooine might have been cooler in the past. For about half the year, Tatooine might be a world without a night as its sun illuminates one face and the companion illuminates the other. It might also be slightly warmer, depending on how distant the companion lies. Why not? I guess that could work. I’m sure that testing this idea would come down to whether you ever see the two stars close to each other again in the movies. It should be a one-time thing if it’s really a wide-ish binary. And, really, everyone (not just Luke) should be out looking at the sunset if that kind of alignment only happens once every 100-1000 years! It is shown elsewhere in the Star Wars movies as two white stars that are always at the same part of the sky. In addition, the two stars were captured in-camera apparently, so we can expect that the yellow sun should be just as orange as the orange sun when it sets that low. Very interesting! I would be interested to know if between S-type and P-type there would be planets in a habitable zone in the L4 and L5 (L-type?) points of binaries. What would the habitable zone look like like for close or contact binaries? I thought contact binaries would be very well suited for habitable planets as more light means bigger habitable zones, but two separates stars means longer lifespan than a single star burning as bright. However as the orbit of its planets would in the same plane as the contact binaries orbit around each other, they would be constantly eclipsing each other every few hours. This would cause the habitable zone to constantly fluctuate to a reduced size, as the 2 eclipse per cycle would half the amount of light the planets receive (a large portion of the cycle for an orbit as small as contact binaries). Would this fluctuating habitable zone mean the habitable zone is much smaller or much larger than expected? In the best case planets could be habitable if they’re in either the reduced or default habitable zone. In the worst case planets would only be habitable if they are in the overlap between both the reduced and default habitable zone. There is an additional issue, which is that very close binary stars tend to make each other spin faster, which causes them to become much more active. This generates a lot more energetic light from the stars (UV and X-rays), which could pose a threat to life. It seems binary stars with a lot of fluctuation don’t allow stable orbits in their HZ. Though a fluctuation of ~10K for seems like it’d be normal for circular orbit in the HZ around binaries. Neither of the papers addressed what I imagine would be a much bigger source of temp variation: Eclipses. Hmmm. Well, the eclipses would be short but there would be a big drop in energy from the stars. I don’t know whether that would be important or not. I’ll ask some colleagues who work on this stuff.